Graphic Design: Banner Signs - The number 1 thing people need to get right. How do I start? > Learning Center > Videos - Graphic Design: Banner Signs - The Number 1 thing people need to get right. There is a fantastic tool on Signs Banners Online dot com that tells you the creative size you need just before you upload. Go to their calculator..., input the sizes and choices of your banner sign. Just before you continue, there is a free feature I want to show you that's been voted as the best handy pre-order tool. It checks the art-board dimensions (Adobe Illustrator, Photoshop, PS Elements, Corel products, Gimp, CAD, Flexisign etc) you should upload for successful sign print manufacturing and tells you the creative size you need. It's easy! That little feature is so handy. "I love it". Also, there is a linked designer page so you can understand how it's made and why that additional fold over bleed area is needed. Their easy template maker, calculator and quick help systems allow you to work in your preferred settings... they all open in your favorite graphic programs such as Photoshop CC. At the Signs Banners Online dot com website, there are many free tools and factory support features that you can use to set up your printed banners anytime!..., and you don't need a login to order. Wow! Their calculator is so interactive and easy to change settings. If you are a graphic designer or buying for the first time wholesale, Signs Banners Online dot com is factory to you making it faster, easier and cheaper. As you add more and more line items (creative) Signs Banners Online checks the fold over bleed needed. You can customize any order to your preferred measurements. If you choose pole pockets or something like that, it shows the fold over bleed needed for that too! So if you're making custom banner signs it is the easiest solution to re-check how to make a banner sign print. 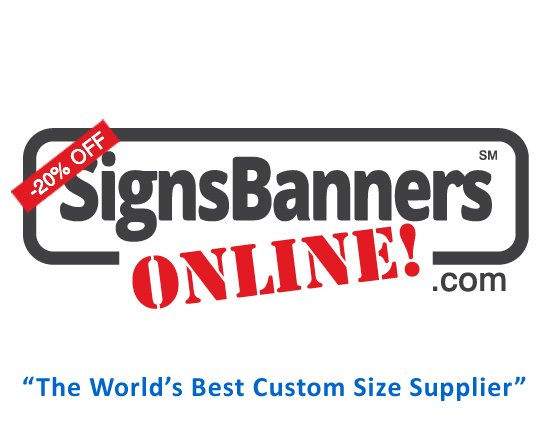 Signs Banners Online is brilliant and is used by hundreds of graphic designers learning how to set up and make banner signs. Many sign companies and advertising agencies, wholesalers and resale marketing people use Signs Banners Online as their supplier... you can use it too! Start now by clicking their special designer example 'how to' support page.